Moving to a $15 minimum wage will cost New York’s Medicaid system more than double what was previously forecast, state budget officials revealed this week. New York will spend $44 million this fiscal year – rising to $838 million by 2020 – to finance Medicaid health providers’ rising payroll expenses, according to the mid-year budget update from the Cuomo administration. 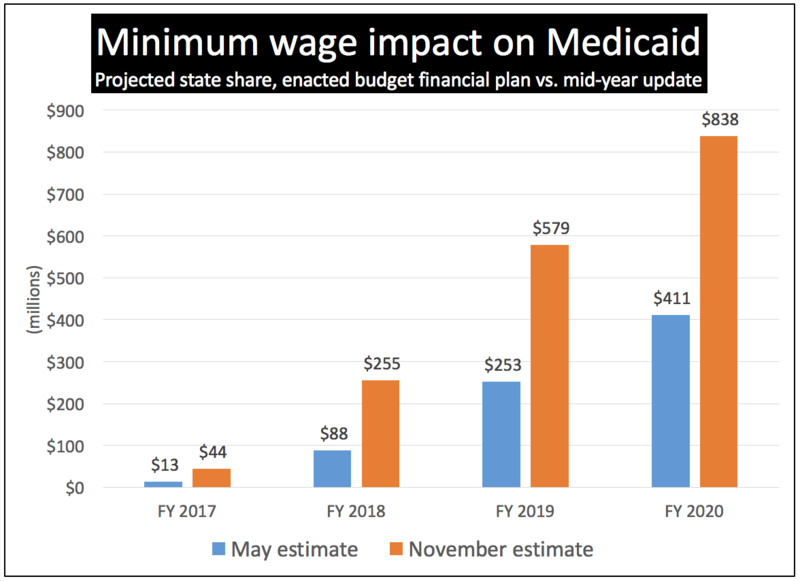 In May, when both the minimum wage and budget had just been enacted, officials estimated the Medicaid impact at just $13 million in the first year, rising to $411 million in 2020 – less than half the new figures. Bear in mind, the estimates represent only the state’s 50 percent share of the Medicaid bill. The total federal-state cost of the wage hike for Medicaid in 2020 would be $1.6 billion. The current $9-an-hour minimum wage begins its climb at the end of this year. In New York City, it will jump to $11 on December 31, $13 at the end of 2017, and $15 for all but the smallest employers at the end of 2018. In Long Island and Westchester County, the wage will rise to $15 by 2022. In the rest of the state, it is scheduled to hit $12.50 by 2021, and thereafter to rise in line with a still-to-be-calculated index. Budget officials said they revised their initial forecast of the Medicaid impact based on “an updated analysis of wage data within the healthcare sector.” The new numbers also reflect enactment of separate legislation providing that home-care workers in New York City and Westchester, Nassau, and Suffolk counties, who were subject to pre-existing “living wage” law, must receive the full benefit of the minimum wage hike, plus an allotment for benefits. There could be more shoes to drop for taxpayers as the hike ripples through the economy, putting upward pressure on wages that are currently just above $15. 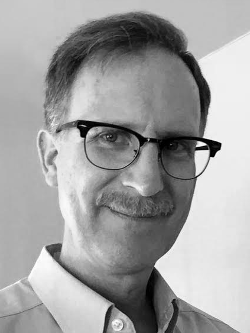 One example is workers who care for the developmentally disabled, whose non-profit employers are dependent on state funding and, through the “Be Fair to Direct Care” campaign, are agitating for the extra money so they can give their workers raises. The mid-year budget update included a second piece of healthcare news with fiscal implications: Enrollment in the state’s Essential Plan – a very low-cost health plan for low-income New Yorkers – came in 50 percent higher than projected at 713,091. An optional benefit under President Obama’s Affordable Care Act, the Essential Plan is available to people who make between 138 percent and 200 percent of the poverty level – just above the eligibility cutoff for Medicaid. Enrollees pay either $20 a month or nothing, depending on income, making it a clear bargain for those who qualify. The federal government is picking up about 85 percent of the cost. Cuomo administration officials had hoped the program would actually save the state $800 million as it shifted certain legal immigrants into the Essential Plan instead of Medicaid, where the state has been paying the full cost. But most of the unexpected enrollment surge is non-immigrants who previously had no insurance or purchased coverage through the state’s Obamacare exchange – and therefore add to state costs when they sign up. The budget office says it has lowered projected savings from the program to $460 million. Of course, those savings could be become huge liabilities if President-elect Trump and Congress follow through on their plans to repeal the ACA. Without federal aid, the Essential Plan at current enrollment would cost New York about $3.7 billion a year.